Well, that’s exactly what we wanted to find out. We conducted a survey of accounting software buyers over the course of 15 months and asked them what features they needed the most from their next system. We also asked about their challenges, company size and what deployment methods they prefer. Get our Accounting Software Requirements Template. Core accounting features matter more than non-essential tools. Buyers want centralization of data and processes. Buyers want their systems to be smarter and more automated. 96 percent of buyers are open to the cloud. In our survey, far more buyers agreed on core accounting as a key feature than the rest. This includes accounting features like general ledger (GL), accounts payable (AP), accounts receivable (AR), etc. With core accounting identified by 94 percent of respondents and budgeting identified by 60, there’s over a 30 percent drop in buyer agreeance. This would suggest that buyers care a lot more about core features than the bells and whistles many vendors are offering. Since most of our respondents came from companies of 100-249 employees, you may be wondering if that’s where the strong preference for core features comes from. It’s easy to assume the smaller businesses are skewing the results, opting only for core features to save resources. But that’s not at all the case. We looked at the data again without the results from buyers in this group and found 97 percent of remaining buyers identified core features of accounting software and only 59 percent identified budgeting. Focusing on buyers from larger companies actually widened the discrepancy, showing us this isn’t a company size-based preference. When we asked accounting software buyers why they wanted a new system, the responses were surprisingly mild. Respondents who reported not having enough features or that their system was too hard to use were in the minority. This is very unlike buyers in many other categories. In our HR buying trends survey, lack of accounting software functions was actually the most commonly reported issue. This was also the case in our survey of marketing automation buyers.  Top answers focused more on centralizing their accounting with other business functions or growth of the business. This makes sense, as core accounting features are pretty standard. Departments seem to be more concerned about having financial visibility across all business functions as opposed to more features. Additionally, there’s been discussion for years over whether or not software will leave accountants without a profession. Some have argued that as processes become less manual, accountants will become obsolete. Staunch defenders of accounting software have offered a different take, reassuring us that accountants will move to a more advisory role. Our data shows the latter is more likely to be true. We can see accountants are already trying to access the bigger picture when it comes to company-wide financials through centralization. Having access to more data helps move accountants to that more analytical role. One major conclusion that came from the data was that buyers are looking for more analytical support. We saw this when over half of all respondents reported forecasting as a accounting feature they’d like to see in their next system. Additionally, 49 percent identified reporting as a key feature with another eight percent divulging that their current system lacked the level of automation needed. With access to forecasts, reports and automation, accountants can go from simply maintaining the ledger to influencing major financial decisions. This also reinforces the idea that accounting will become a more strategic role as software plays a larger part in this field. In fact, many of these buyers are leaders in their finance departments. Buyers aren’t looking for software to completely replace their teams. What they’re looking to do is make the most of an employee’s time and the company’s resources. While it’s important to invest in your daily functions, you also need to think about business development. Accounting software is the way businesses will be able to fund strategic development. It seems cloud computing has become the standard in nearly every software category, and accounting is no exception. A large majority (71 percent) of respondents were open to either type of deployment. We saw an impressive 25 percent of respondents report they were considering cloud-based solutions only. This means any product that only offers on-premise deployment is missing out on a quarter of their possible customer-base. However, four percent of respondents reported seeking on-premise solutions exclusively. While the benefits of cloud-based deployment are numerous, there will always be a small subset of buyers who need their system to exist on-premises for compliance reasons. Despite this, it’s clear to see the immense popularity of the cloud. If cloud-based products suddenly go out of style, it’s not because buyers won’t invest in them. The graph under the Key Insights section provides a quick rundown of the top accounting software features buyers look for. 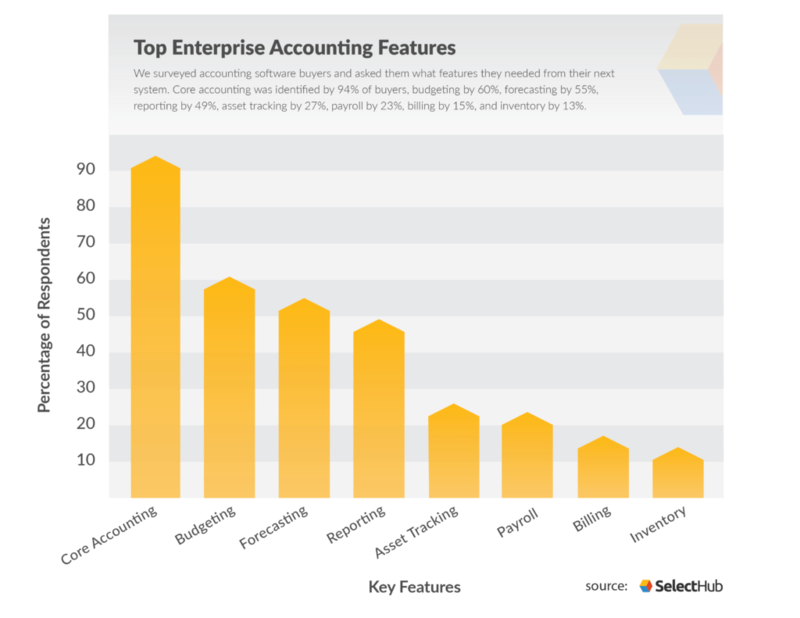 First, it’s no surprise core accounting comes in as the most-requested feature with 95 percent of buyers identifying it. But what about the last five percent of buyers? It’s easy to assume they still needed core accounting but didn’t mention it, seeing these features as a given. However, one buyer specifically mentioned not needing any AR as it was handled outside of her company. It could be possible that a few buyers are looking for non-essential features only. Budgeting was the second-most identified accounting feature, at 60 percent. Forecasting came in third with 55 percent of respondents and was named concurrently with budgeting about 90 percent of the time. Reporting was identified by 49 percent, asset tracking by 26 percent, payroll by 23 percent, billing by 15 percent and inventory by 13 percent. Less than two percent of buyers came from companies with 1-99 employees. 13 percent of buyers came from companies with 250-499 employees. 13 percent of buyers came from companies with 500-999 employees. Less than two percent of buyers came from companies with 2,500-19,000 employees. Less than two percent of buyers came from companies with 20,000-49,000 employees. Just under six percent of buyers came from companies with over 50,000 employees. 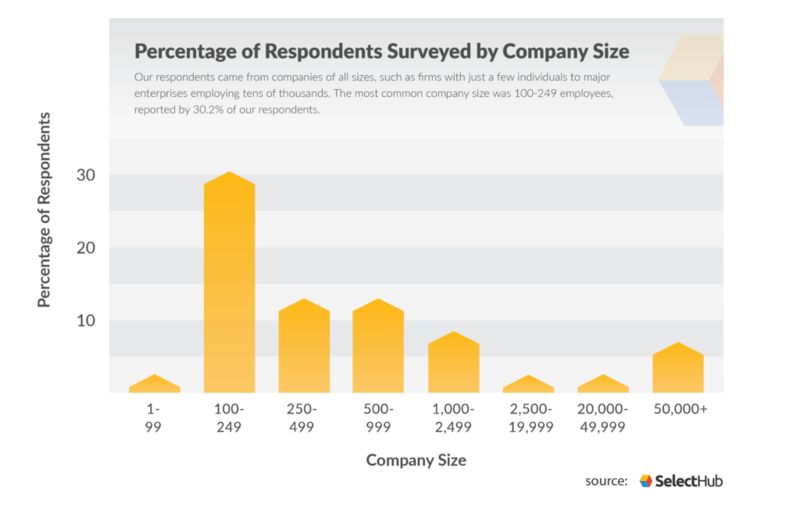 A little less than 25 percent of our respondents did not disclose their company size. The biggest complaint about buyers’ current systems wasn’t much of a complaint at all, with 26 percent of buyers reporting that it was time for an upgrade. These buyers didn’t necessarily find anything wrong with their current system. They merely wanted something more powerful. About 17 percent of buyers wanted more centralization from their system. This includes integrating other existing software and having access to data from other parts of the company. Of those surveyed, 15 percent reported that their current system couldn’t handle the growth their business was experiencing. Some of those buyers wanted to leave room for projected growth as well. About 15 percent of buyers said their system was too old. Many of these systems were confirmed for discontinuation, but some buyers were just evaluating newer options. Eight percent of buyers wanted a more automated system, and an equal number of buyers wanted more reporting. Six percent of buyers felt their current system was hard to use, and four percent of buyers didn’t have enough features. This is different than needing an upgrade in a couple of ways. Buyers who wanted more accounting software features were likely looking for more functionality that’s different than what their current system offered. Moreover, buyers who wanted an upgrade didn’t have a longer accounting software features list of key functionality. This is what lead us to believe they were happy with what their current system offered, they just wanted more of it. This point goes hand in hand with the strong preference for core features among our respondents. It seems like most vendors are offering the right amount of features, but should think about improving them. Overall, it seems like buyers want software that will push their departments to a more advisory position. We see this a few different times in the data. First, we can see it when buyers ask for more centralization, as more integrated data means more visibility to make decisions. They also want more automation and reporting. Reduced responsibility for tedious tasks and easy-to-understand reports are both great to free up time for strategy. It also was apparent that buyers thought a more advanced accounting system was the solution. Even the few respondents with hard-to-use systems weren’t looking for a less sophisticated solution. However, a sophisticated system doesn’t mean more features for accounting software buyers. Core features were prioritized by buyers by far. While they were getting core accounting features from their current system, they wanted them to be stronger to handle growth. Did you get a chance to voice your opinion in our survey? If not, let us know what accounting software features you look for and your biggest challenges in the comments below!